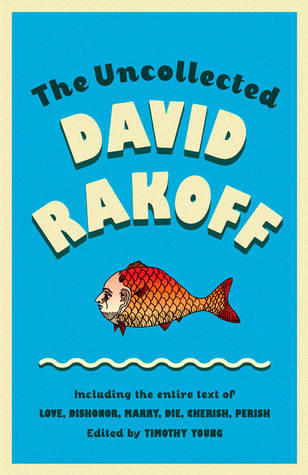 The Uncollected David Rakoff by David Rakoff is a highly recommended collection of his writing. This volume includes the entire text of "Love, Dishonor, Marry, Die, Cherish, Perish," early fiction, memoir pieces, travel writing, essays, and reflections on life as a gay man, as well as transcripts of his memorable appearances on public radio's Fresh Air and This American Life. Rakoff was best known for his wit and humor, both of which are captured in this collection. As in most collections not every piece will strike a chord with everyone, but most readers are going to find a genuine connection to more than one of the pieces. For example, in "The Love that Dare Not Squeak Its Name," Rakoff discussion about E.B. White's Stuart Little as a gay icon will likely be a hit for most readers, as will Love, Dishonor, Marry, Die, Cherish, Perish, Rakoff's novel written in verse. Themes of family and friendship are a common thread, along with life as a gay man. 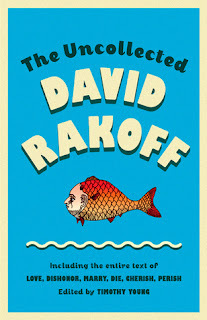 Obviously not being a gay man limits some of my emotional connection to all of the stories, but Rakoff's wit is evident and all of the contents are well written and enjoyable. Those who recall interviews with Rakoff on public radio will likely appreciate the transcribed pieces immensely. This is a collection that fans will likely want. My Sister of Perpetual Mercy; Sagrada Família; My First New York: Arrived: 1982; An Open Letter to My Sisters; Goodbye to All of You; A Former Smoker Cheers; Diary, 1998; What’s Up, Dike? ; The Wizards of Id; [Laura Bush]: The New York Times, Op-Ed; The Love That Dare Not Squeak Its Name; David Rakoff: Essayist, Mountaineer, “Comic Saint,” Fresh Air Interview; Fu Fighters; Evergreen Safari; Northern Composure; A Basket Case in North Carolina; Traveler’s Tale: A New Yorker Is Born; Walk This Way; I Like My Dog. Yours? Not So Much. ; King of the Forest; Tweenage Wasteland; Unaccustomed as I Am … How to Give a Wedding Toast; David Rakoff’s Half Empty Worldview Is Full of Wit: Fresh Air Interview; The Craft That Consumed Me; The Waiting; When Bad Things Happen to Do-Good People; Author David Rakoff Calms Himself by Keeping a Full Pantry; Oh! The Places You Will Not Go! : (Co-written with Jonathan Goldstein); Stiff as a Board, Light as a Feather: This American Life; Love, Dishonor, Marry, Die, Cherish, Perish.